I recently switched the guest room with my studio because I needed more space and who really needs a large guest room? 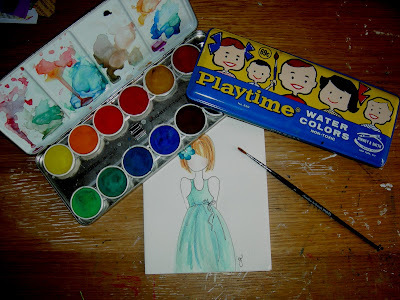 I found this watercolor tin from when I was little. Isn't it adorable? I then hunted down my "good" set from college years that was hardly used at all. The cover is plain silver and not at all cute! Grabbing some watercolor note cards, I sat down last week on a rainy day and decided to paint some thank you cards for some much deserved people. It was such fun to use a media that I never use. What a lovely idea to paint thank you cards. It sounds like you had a lovely time too. It is such a treat to be able to come and visit you in blog land across the miles from France. Thank you so much for making this such a delightful place to visit. Damn girl!!! You can make anything look beautiful!!! See you soon!!!! Julie, I LoVe this card! So sweet and one of my favorite colors, Tiffany Blue! I 'm especially charmed with the flower in her hair!